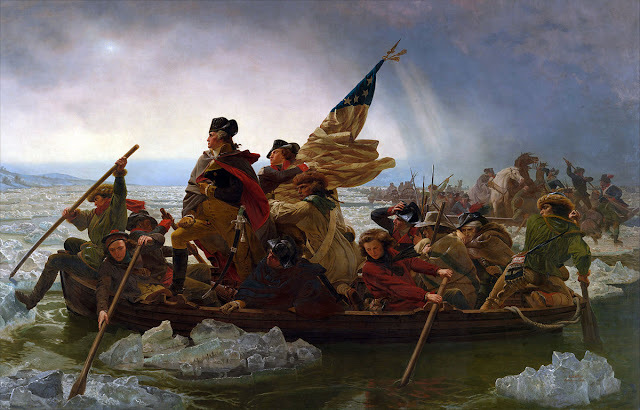 Washington Crossing the Delaware by Emanuel Leutze, 1851. Washington's Crossing State Park, in Buck's County, PA, is a park in two parts -- one where the crossing itself occurred, and another part -- just as, if not even more interesting, just up the road. The park commemorates the famous Crossing as the turning point of the American Revolution. Boiled down, on the night of December 25, 1776, General George Washington and a small army of 2,400 men crossed the Delaware River at McConkey's Ferry, on their way to attack a Hessian garrison of 1,500 in Trenton, NJ. The crossing was a desperate act made by a desperate general: the Continental Army had suffered devastating defeats in New York and New Jersey prior. Morale was the lowest it had ever been during the American Revolution, and the crossing and the subsequent victory at Trenton renewed hope among the Continental Army, Congress and the colonists. Later, at the Battle of Trenton, they were able to force the Hessian soldiers to surrender, without any American casualties, essentially turning the tide of war to favor the Americans. also had general stores that sold a wide array of merchandise. Not surprisingly, there was a who's who of American history crossing the Delaware River that fateful night. Two future Presidents: George Washington, of course, and James Monroe, and one future Vice President: Aaron Burr. There also was a future Chief Justice of the United States, John Marshall; a future Secretary of the Treasury, Alexander Hamilton, and a future Secretary of War, Henry Knox. The stately home is the Mahlon Taylor House, and demonstrates Taylor’s successful career as a merchant and entrepreneur. The house is a fine example of the degree to which the fashions and refinement of upper-class Philadelphians were beginning to influence rural Pennsylvania. Built in 1816-17, the house epitomized Taylor’s success. Start your visit in the lower park at the visitors center. It features a small exhibition with some Revolutionary war artifacts, and an original letter written by George Washington while in the Mckonkey's Ferry Inn. Spring for the ticket for both tours -- a bargain for $11. When we were there our tour guide was a gentleman who'd grown up in a house (now gone) right next to the barn housing the Durham boats. A well-read and thoughtful history buff as well as park docent, he answered our many questions (I know, sadly, very little about the Revolutionary War, although ask me a question about the Civil War and I'd probably have the answer...). The lower park includes 13 historic buildings including McConkey's Ferry Inn, where General George Washington and his aides ate dinner and made plans prior to the crossing. Among the historic buildings is a 20th-century barn that houses five replica Durham Boats. Durham boats were large, open boats that were used to transport pig iron along the Delaware River at the time of the Revolution and these boats, along with the ferries and others, were used to transport soldiers, horses, and equipment across the river on the night of December 25–26, 1776. After you tour the buildings, including McConkey's Ferry Inn, around the lower park, drive the 4.5 miles north on Route 32 to visit the upper park and tour the wonderful Thompson-Neely House, pay your respects to the fallen soldiers buried nearby, and go up Bowman's Hill Tower, which marks where Washington's troops were supposed to have kept a lookout on British troops' movements. The Thompson-Neely House, was used as a military hospital during Washington's encampment in the area, and the graves of an estimated 40 to 60 soldiers who died there. Unfortunately it was raining -- and raining hard -- when we visited, so we did not go pay our respects to these brave men. The Thompson-Neely House was probably my favorite part of the park. It's pretty typical of colonial construction--a farm house added onto over the years, starting first with a low, single room building (although it's likely it had a loft), then as additions were added, the house grew. On the National Register of Historic Places, The Thompson-Neely House is a fine example of middle-class 18th-century architecture. Its expansion from a low, one-room dwelling to a two-story, multi-roomed farmhouse reflects the growth of colonial Pennsylvania’s agricultural economy and the prosperity enjoyed by those who milled grain into flour for export. The second owner of the property, Quaker miller John Simpson, constructed the original central section of this house about 1740, as well as a gristmill along Pidcock Creek. At the time of his death in 1747, Simpson was a prosperous farmer with an interest in a sawmill besides his other holdings. His widow, Hannah, married Scots-Irish miller Robert Thompson in 1748, whose farming and milling businesses on the property made him one of the wealthiest men in Solebury Township by 1761. The exact location of the graves is unknown, though they were partially unearthed during the construction of the nearby Delaware Canal in the early 19th century and during other nearby construction projects. Presently there are 23 memorial headstones as a reminder that the area is a gravesite. While you're touring the lower park, consider stopping by for dinner at the lovely Washington's Crossing Inn, a restaurant offering traditional American fare, served among fireplaces or on the patio at this preserved 1817 home. You can expect entrees such as the Washington Crossing Mixed Grill, a combination of grilled rosemary lamb chops, mesquite honey spare ribs, beef filet medallions served with fries and summer slaw; salmon with lemon caper sauce served with asparagus, mashed potatoes, and caper popcorn, or chicken schnitzel -- thinly pounded and panko-breaded chicken breast, served with mashed potatoes, sautéed spinach and lemon caper sauce. We enjoyed both the dinner (delicious!!) as well as the lovely surroundings. Getting there: The park visitor's center is located at 1112 River Rd, Washington Crossing, PA 18977; the Thomas-McNeely house is located 4.5 miles north of the visitors center on River Road/Rt 32. Washington's Crossing Inn is located at General Washington Memorial Blvd, Washington Crossing, PA 18977. Dogs: Park yes, buildings no, restaurant no. Hours: The park's visitor's center is open every day, 10 am – 5 pm; the park provides tours 7 days a week, 10-4, seasonally -- check in at the visitor's center for more information. Please call ahead to be sure that the tower and Thompson Neely House are open. The grounds are open from dawn to dusk for free self-guided tours. Check the Washington's Crossing Inn's website for hours and to make reservations. Websites: Washington's Crossing Historic Park -- http://www.washingtoncrossingpark.org/; Washington's Crossing Inn -- http://washingtoncrossinginn.com/. Follow the MidAtlantic Day Trips Blog on Facebook, Twitter, Instagram, Pinterest, and LinkedIn. In May 2016, I started a series of posts about Bucks County and New Hope. To see others in this series, click on the label "Bucks County," below. This is a great bit of information. I don't live too far, but I'm not sure I've ever been there. I will definitely go. Thanks -- and glad to hear that you'll check out this park! It's definitely worth the visit! The Battle That Saved D.C.